A country of South or Central America, or central Asia, seems most likely to be the world’s ‘horsiest’. These are regions with more horses per person and where they are dense on the landscape. Mongolia has more horses per person than any other nation – 66 per 100 people* – as if almost every adult Mongolian owns a horse. Mongolia is ‘horse lengths’ ahead of the next contenders: Iceland with 24.5 horses per 100 people and Uruguay with 12. Kazakstan, Argentina, Kyrgyzstan, Sierra Leone, Cuba, Panama, and Mexico complete the top 10 nations where the horse is most commonly owned with from 9.5 down to 5.6 horses per 100 people, in that order. No other country has more than 5 horses per 100 people. It is puzzling that the West African nation of Sierra Leone makes the top 10 nations where horses are most common. African horse sickness, a virus spread by biting midges and mosquitos, makes the continent generally unfavourable for horses. 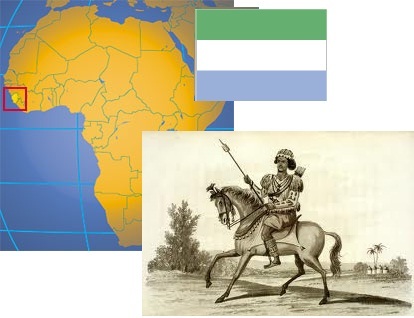 I was surprised, therefore, to also find Sierra Leone as the country most dense with horses – almost 6 per square kilometre (15.4 per square mile). Senegal, another West African nation where working horses are common, is also in the top 10 nations for horse density – ranked 5th with 2.7 horses per km2 (7 per square mile). These nations are intriguing exceptions in the least horsey continent on the planet and warrant closer investigation. After Sierra Leone, the list reads like an American starting lineup. Cuba has 5.9 horses per km2, El Salvador 4.6 and Mexico 3.2. After Senegal in 5th, the top 10 list of nations where horses are most dense continues Panama, Costa Rica, Uruguay, and Nicaragua. Lesotho, another African oddity, is sandwiched between the last two in 9th place. With the exception of Kyrgyzstan, the 11th nation on the list with a smidgeon over 2 horses per km2, no other nation has more than 2 horse per km2 or 5 per square mile. Is the horsiest nation the country where horses are both common and dense? 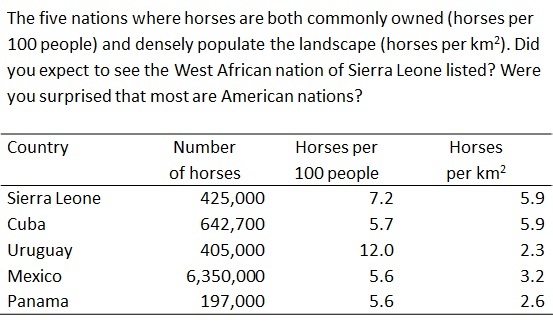 If that were the case Sierra Leone would be the horsiest nation on the planet – ranked first for horse density and seventh for number per person (see Table below). You didn’t see that coming did you? – me neither. After Sierra Leone it is the Central American nations that dominate the list of places where horses are both common and dense: Cuba, Uruguay, Mexico, and Panama – very horsey nations. But this list of the world’s horsiest nations might be unsatisfactory to many. Sierra Leone, for example, is a small country (less than 1% of the USA’s size) with a small population (5.9 million). Cuba too is small. I think Mexico is the world’s horsiest nation. Not only are horses common and dense in Mexico, but it rivals China and the USA, much larger nations, for being the country with the most horses. Although Mexico is a country of moderate size and population it has 6.4 million horses compared to China’s 6.8 million and the USA’s 10.2 million. My prejudice, however, is to award the title ‘world’s horsiest nation’ to Mongolia. 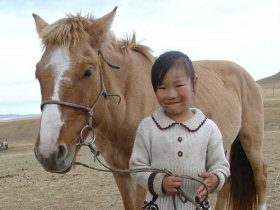 Horses are not dense in the inhospitable landscape of Central Asia, but few Mongolians do not still understand and minister to horses in their day-to-day lives. * In text statistics from www.fao.org for 2011.